Passengers, like Sarah, depend on Metro transit to get to work, school and other important destinations. 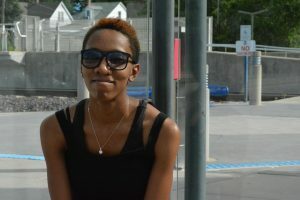 We hope you enjoy her story, and we’re interested in your transit story too. Email mrhibbard@metrostlouis.org, and we may share your story in a future “Passenger Profile” blog. When Sarah was about sixteen years old, her mother wanted to teach her responsibility. One way to do that was by teaching her how to use MetroBus. It’s a good thing Sarah’s mother taught her the in’s and out’s of using public transit, because Sarah rides Metro a lot these days. Sarah also depends on MetroBus and MetroLink to get her back and forth to work. She boards the #1 Main Street – State Street MetroBus to the Belleville MetroLink Station. From there, she rides the train to either the 8th & Pine or Stadium MetroLink Station. She said her work commute takes about 45 minutes. Sarah said one of the main reasons she chooses Metro is to save money on gas. She added taking Metro also provides her a stress-free commute. “You don’t have to use your energy driving on the highway and dealing with traffic,” she said.